Mendel Wines combines old vines grown in the high altitude vineyards of Luján de Cuyo in Argentina with the impeccable winemaking talent of Roberto de la Mota. Roberto de La Mota is no stranger to the International Wine Review. We’ve reviewed his outstanding wines over the years and introduced them to wine enthusiasts around the world. In this article we review Mendel’s current releases. The US importer is Vine Connections. The Mendel vineyards are located in Perdriel and Mayor Drummond at between 900 and 1100 meters above sea level in Luján de Cuyo. Vines are planted at relatively high density (5,555 vines/ha) and planted with a north-south orientation. Grapes are hand picked and sorted and macerated in small fermentation tanks of 50-80 hl. 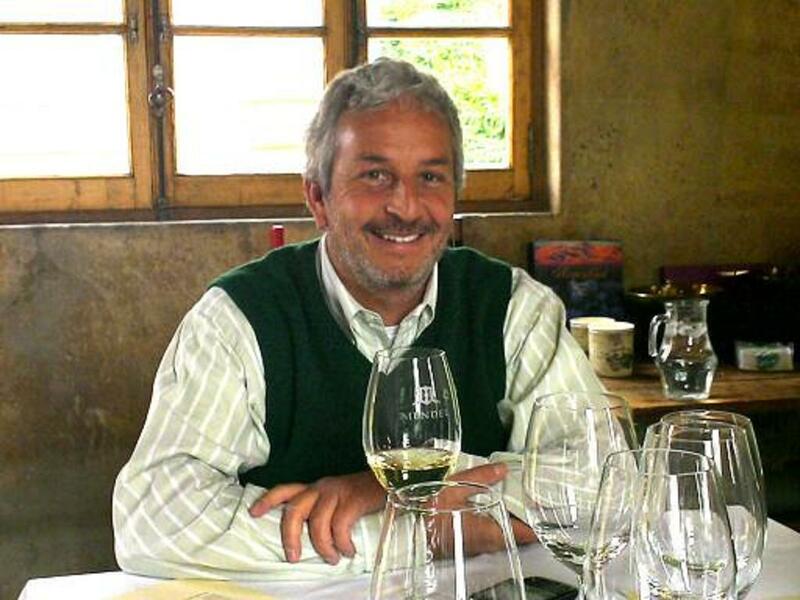 Roberto de la Mota is one of Argentina’s finest winemakers. He is a partner in Mendel Wines with Anabelle Sielecki, where he crafts some of Argentina’s finest wines. (Mendel is the first name of Anabelle’s father.) He’s son of legendary Raúl de la Mota, who made Argentina’s first internationally recognized wines at Bodegas Weinert, Roberto has been in the wine business since 1979 when he was a 19-year old apprentice to his father at Bodegas Weinert. He received his academic training at Cuyo National University in Mendoza and at the Ecole National Superieure Agronomique de Montpellier in France. In Argentina, Roberto established his reputation as winemaker with Terrazas de los Andes and creator of Cheval de los Andes. In 2003 he helped found Mendel Wines. Mendel 2014 Semillon Mendoza ($25) 91+ Medium straw. With a perfumed bouquet of citrus, pear, almond, rosemary and other herbs, Mendel’s Semillon is always one of Argentina’s best. The 2014 vintage is clean with good acidity, minerals, and a hint of cured lemon on the palate, all beautifully integrated and delicious. From vines of an average age of 73 years located in Altamira, La Consuta, and San Carlos; 15% of the wine is fermented in new French oak. Mendel is one of the very few producers of Semillon in Argentina, and its cuvee is first-class. Mendel 2013 Malbec Mendoza ($30) 91 The Mendel Malbec offers spicy dark red fruit with hints of chocolate and cracked black pepper. It’s big avored with a rich, dense character, finishing firm. From 85 year old vines of the Mayor Drummond vineyards in Luján de Cuyo; aged 12 months in 1/3 new French oak. Mendel 2013 Lunta Malbec Lujan de Cuyo ($22) 89 This is Malbec done in a fresh, easy drinking style. It offers dark red fruit with blackberry notes and chalky tannins on the finish. Made from 86 year old vines grown in deep clay soils on the southernmost parcel of the Mendel estate vineyard. Aged 12 months in 35% stainless steel, 65% French oak, one-third new. Mendel 2011 Finca Remota Uco Valley ($115) 94 The single vineyard Finca Remota is very full and dense, layered with bold flavors. Showing enticing aromas of blackberry, cocoa powder, violets and spicy French oak, it’s silky smooth on the palate with red fruit accents and toasted oak that’s not yet fully integrated. The finish is long and unctuous with firm, chalky tannins. Made from hand-harvested 75 year old, self-rooted Malbec vines grown at 3600’ in Altamira, located 120 km south of Mendoza; aged 18 months in all new French oak. Mendel 2013 Cabernet Sauvignon ($30) Luján de Cuyo ($30) 91 This is excellent Mendoza Cabernet Sauvignon, showing cassis, cedar and spicy oak. It has a firm backbone and additional blackberry and toasted oak notes on the palate, finishing with dry tannins. An ageworthy wine that should evolve nicely over at least another decade. From 14 year old vines in Perdriel; aged 12 months in 1/3 new French oak. Mendel 2012 Unus Mendoza ($50) 93 Unus is a Malbec blend with a delightful perfumed nose of dark roses, black raspberry, pepper, and toasty oak. The palate reveals excellent depth and layers of red and black fruit that lingers on the finish. A blend of 65% Malbec, 30% Cabernet Sauvignon, and 5% Petit Verdot from vineyards with an average age of 82 years located in Perdriel and Altamira and aged 16 months in all new French Taransaud oak. This entry was posted in Argentina, Cabernet Sauvignon, Countries and Regions, Red Wine, Uncategorized, White Wine and tagged Argentina, Malbec, Mendoza, Roberto de la Mota. Bookmark the permalink.